Also serving communities of Long Lake. There are 60 Assisted Living Facilities in the Wayzata area, with 5 in Wayzata and 55 nearby. The average cost of assisted living in Wayzata is $3,365 per month. This is higher than the national median of $3,346. To help you with your search, browse the 180 reviews below for assisted living facilities in Wayzata. On average, consumers rate assisted living in Wayzata 4.5 out of 5 stars. Better rated regions include Shorewood with an average rating of 5.0 out of 5 stars. Caring.com has helped thousands of families find high-quality senior care. To speak with one of our Family Advisors about assisted living options and costs in Wayzata, call (855) 863-8283. Wayzata is located to the west of the Minnesota-Saint Paul metropolitan area, in Hennepin County. Its proximity to major attractions such as the Mall of America and the Minnesota Zoo make it a popular spot for tourists and seniors in the area. Hennepin County is home to more than 1.2 million residents, 13.6 percent of whom are over the age of 65. There are five assisted living facilities in Wayzata, with an additional 52 located nearby in the Minnetonka, Golden Valley and Minneapolis areas. While the cost of living in Wayzata is almost 60 percent higher than the U.S. average, seniors living in the area can save on the cost of health care, which is 13 percent lower than the national average. Harsh winters are common in Wayzata, which may be uncomfortable to many seniors. The city has an average January low temperature of only 6 degrees Fahrenheit and an average annual snowfall of 51 inches. By comparison, the U.S. national average January low temperature is 22.6 degrees and the country's average annual snowfall is only 26 inches. Metro Transit offers seniors a safe way to travel throughout Wayzata and the Twin Cities metropolitan area. Seniors over 65 are eligible for reduced fares. There are plenty of arts and culture in the Wayzata area for seniors to enjoy. Some assisted living facilities may offer supervised day trips for residents to visit the area's top attractions such as the Minnesota Zoo and Walker Arts Center. The Wayzata area has an array of community resources available to seniors, including the Senior Initiative, which is a volunteer organization that plans events and activities for local senior citizens, as well as one senior center. Wayzata's air quality has been assigned a passing grade by the American Lung Association. Seniors who have existing respiratory conditions needn't be overly concerned about the local air quality having a negative impact on their health. Assisted Living costs in Wayzata start around $3,365 per month on average, while the nationwide average cost of assisted living is $4,000 per month, according to the latest figures from Genworth’s Cost of Care Survey. It’s important to note that assisted living rates in Wayzata and the surrounding suburbs can vary widely based on factors such as location, the level of care needed, apartment size and the types of amenities offered at each community. 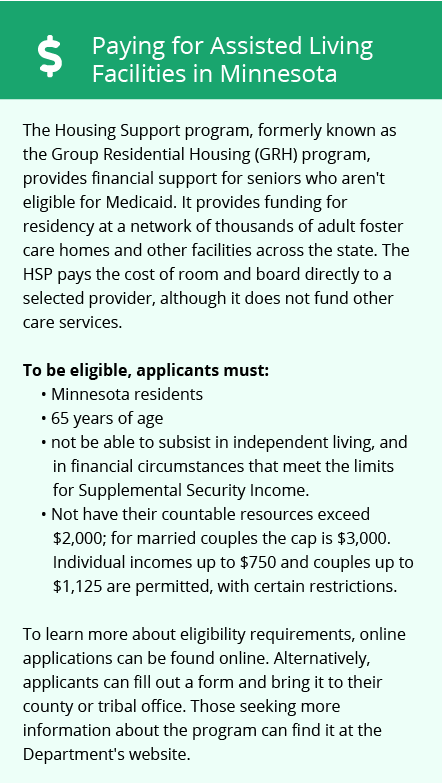 Minnesota makes several Medicaid 1915(c) Waiver programs available to residents of assisted living facilities. Seniors in the Wayzata area can apply for financial assistance under one of the following waiver programs: Elderly, Traumatic Brain Injury, Community Alternatives for Disabled Adults or Community Alternative Care. Of course, each senior should apply for the program that is most applicable to their own specific circumstance. 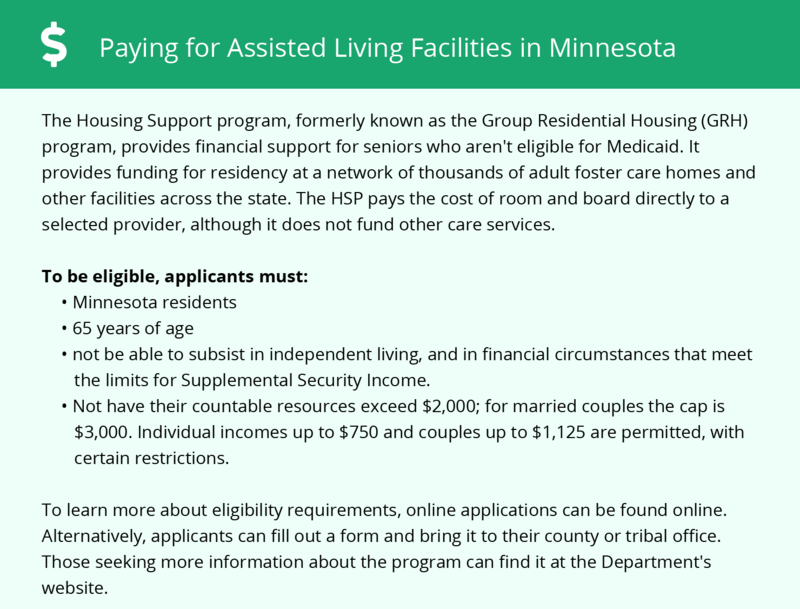 Seniors who receive Supplemental Security Income have the option of applying for an additional state supplement to help them pay for room and board costs in assisted living facilities. These costs are not capped by the state, even for SSI or Medicaid recipients. Minnesota does allow family supplementation. Wayzata and the surrounding area are home to numerous government agencies and non-profit organizations offering help for seniors searching for or currently residing in an assisted living community. These organizations can also provide assistance in a number of other eldercare services such as geriatric care management, elder law advice, estate planning, finding home care and health and wellness programs. To see a list of free assisted living resources in Wayzata, please visit our Assisted Living in Minnesota page. Wayzata-area assisted living communities must adhere to the comprehensive set of state laws and regulations that all assisted living communities in Minnesota are required to follow. Visit our Assisted Living in Minnesota page for more information about these laws.